Eastern Kansas League rivals Blue Valley and Blue Valley West will square off in a regular season rematch with the winner advancing to the 5A state title game in Emporia. The Tigers and Jaguars met to decide the District 4 championship in Week 9 with Blue Valley West rallying for an 18-17 win. In that first meeting, Blue Valley seemingly controlled the game for three quarters in building a 17-6 lead. Blue Valley West rallied in the fourth quarter and Troy Burgett kicked a 24-yard field goal as time expired to lift the Jaguars to the one-point win. The Tigers were hurt by four turnovers in that game including three second-half fumbles. It was Burgett who earlier connected on a 32-yard field goal with 6:11 remaining in the game to pull the Jaguars to withing 17-15. Expect another close game this time around. Blue Valley West is finally getting healthy after battling some injuries all season. Grant Garcia rushed for 116 yards in that earlier meeting, and added a 40-yard touchdown in last week’s win over Bishop Miege. West produced nearly 300 yards on the ground against Miege, but was also helped by six Stag turnovers. Blue Valley West scored 28 points off of Stag turnovers in the 38-24 win. They Jags will need a similar performance on the ground against a good Blue Valley Tiger defense. In the first meeting, West displayed a balancd offense in rushing for 177 yards and passing for 167 more. That’s been the signature of their senior quarterback Ryan Ralston, who at 6-foot-4 and 225-pounds, can run over defenders or beat them deep with his strong arm. He looks for Luke Curtis, Yousef Alagha, or Spencer Johannesman when he looks to throw. Johannesman caught eight passes for more than 100 yards in the earlier meeting with the Tigers. 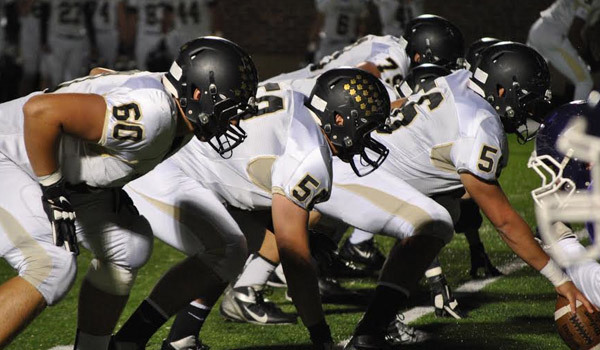 Blue Valley quarterback Logan Brettell can be a dual threat out of the pistol as well. The senior instead chooses to give the ball to Chance Nelson who has rushed for 1,583 and 18 touchdowns on the season. Montana Brady also has big-play capability out of the backfield. Tiger receivers Mikey Henson, Tristan Perkins, and Frankie Gomez all have the ability to stretch the field. This should be a great game. After a heart-breaking loss in last year’s quarterfinals, Blue Valley West may have just enough to get back to their first title game since 2007. This is Salina South’s second straight trip to the semifinals. Before last season, the Cougars hadn’t made a final four since a championship in 2004. Kapaun Mount Carmel has won nine state titles, second-most to Lawrence in state history, but has no crowns since 1987. This marks the farthest appearance for KMC since a semifinal showing in 1990. South has played the No. 1 strength-of-schedule (SOS) in Class 5A and leads the classification in scoring offense at 485 points. Kapaun has outscored teams 347-216, but has just one loss. South won a thrilling 21-19 victory against Bishop Carroll last week that ended the Eagles’ 23-game winning streak. Senior quarterback Justin Stonebraker has completed 88 of 147 passes for 1,586 yards with 22 scores against four interceptions. Senior Mike Jones has 197 carries for 1,658 yards and 28 scores, while senior Zach Nachbar has 43 catches for 1,048 yards and 16 TDs. Junior Braden Burlew leads the Cougar defense with 12 tackles for loss. Kapaun senior defensive lineman Sam LaFleur has 60 tackles, 12 for loss, to lead a strong Crusader defense. Ethan Harp ran for 141 yards and four scores and quarterback Brock Monty rushed for 98 yards and a score and passed for 78 yards and a TD as the Crusaders rallied from a 14-point second half deficit en route to a 44-42 victory against Salina Central last week. Kapaun has enjoyed a memorable season, but South simply has too much talent.